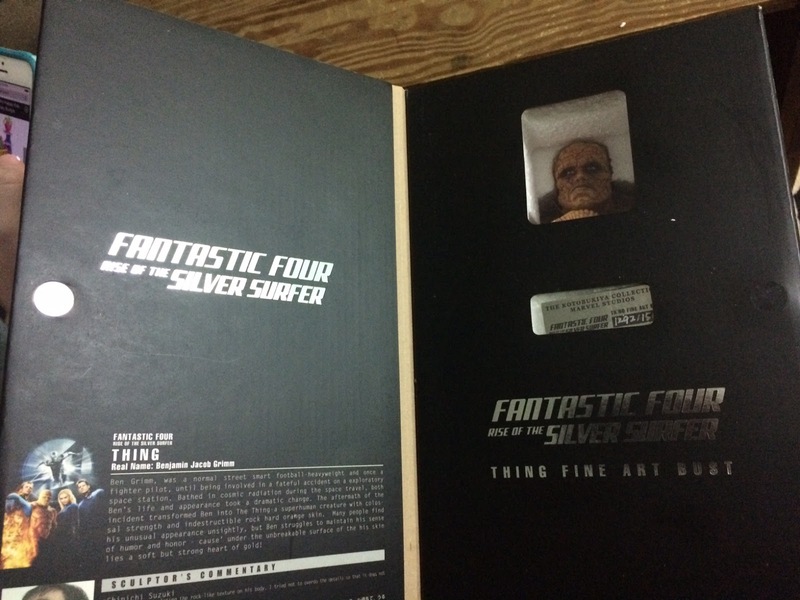 This shouldn't come as a surprise to anyone, but there wasn't a lot of merchandise put out for the 2007 Fantastic Four movie sequel, "Rise of the Silver Surfer", at least when compared to the previous film in 2005. I remember watching the movie when it came out - I was in the state of Washington for the summer, and I found a drive-in theater that was playing it. It was apparently labeled as the kids' feature, as it was paired with the animated film, "Surfs Up". There are only a few things I remember about that night at the drive-in. First, "Surfs Up" was a terrible movie. Just awful. I'd never remember it even existed if I didn't force myself to stick it out just so I could see the Fantastic Four sequel. 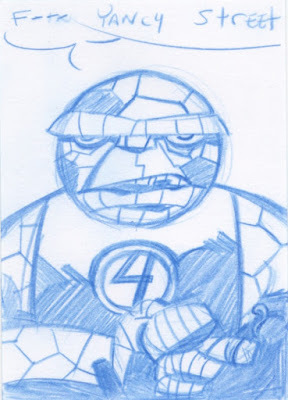 Next, "Fantastic Four: Rise of the Silver Surfer" was not worth sitting through "Surfs Up" to see. As disappointing as the 2005 movie was (don't kid yourself with that "it wasn't that bad stuff"), the Silver Surfer movie was a directionless disaster, one that featured a not-at-all-tongue-in-cheek Mr. Fantastic dance scene. 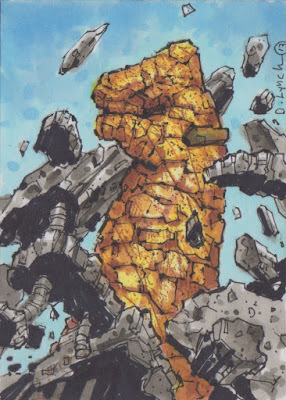 Most people (justifiably) gripe about the Galactus cloud, but for me, I checked out after seeing Reed Richards do that weird spiral dance move that was almost certainly made for what I assume was a 3-D release. Anyway, it wasn't long after that I first saw the Kotobukiya Collection Thing statue, based on Michael Chiklis's portrayal of the character, but it took another ten years or so for me to actually buy it. Despite the fact that the statue does actually look pretty good, I wasn't in a hurry to purchase something that came from such a boring film. Several months ago, though, I found one on eBay at a good price and pulled the trigger. So let's take a look! ...and the Punisher, Daredevil and Blade designs on the back. The box itself feels like part of the product, and you could display it as such. Case in point: the box has a front "cover" which attaches to the inside with a magnet. 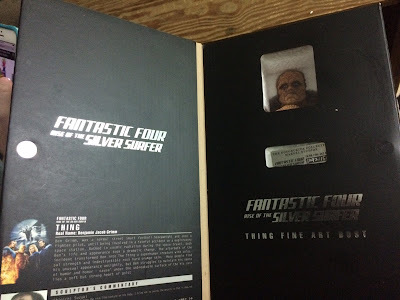 The inside flap has a window box where you can see the Thing, trapped I guess, along with a numbered mini placard and the movie logo. Here's a better shot of the metallic numbered slip. I guess there were 1500 of these made. The statue itself is very nicely made. You can tell this is designed after the Chiklis-Thing, but the body is rougher and rockier than the foam-like suit worn in the movie. The base is a little weird, with columns or pillars seemingly holding the Thing up on his pedestal. The front of the base is set up, I imagine, to look like a movie marquee, with the movie's logo again showing up. The less we're reminded of this film, the better, Kotobukiya! ...lights up? It's not a terrible feature as far as novelties go. It does seem pretty odd to add this to a "fine art" statue, and it does attract even more attention to that damn logo, but it doesn't look too bad. This honestly might be the only piece of merchandise I own from the 2007 film. It's not the best Thing statue I own, but I like it, and if nothing else, it's certainly the brightest! Happy holidays, everyone! Let's look at some Thing sketch cards I've picked up semi-recently! D. Lynch - I like this card for several reasons: 1) It's a different shot of the character than what you might normally expect; 2) It's fully colored; 3) It might be drawn by David Lynch, creator of "Twin Peaks" (I mean, who can say for sure?). 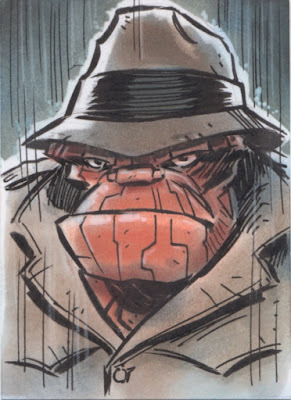 Shawn Atkins - Atkins is a Pittsburgh local and even though he writes swear words on sketch cards, I like his work a lot. I picked this up at the Toonseum last summer; he's also got an Invisible Woman card there that I have to believe I'll eventually purchase. 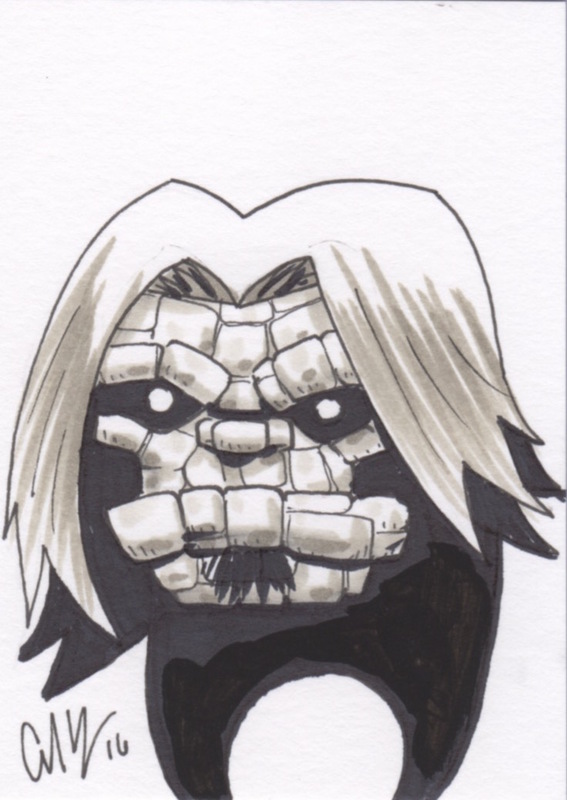 Carl Yonder - I backed artist Carl Yonder's "Leo Cosmos" Kickstarter project and pledged at the level that got me, among other things, a sketch card, so naturally I requested a drawing of the Thing. Carl drew a mashup of his character and Ben Grimm, which is why the Thing sports hair in various places. 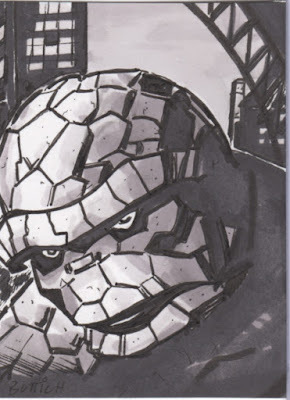 Carl has previously drawn the Thing in my sketchbook and is a fellow FUBAR contributor! Matthew Buttich - I found this card on eBay and watched it for an estimated million years before finally pulling the trigger on it. I think the different shades of black add a lot to this card. Tim Shinn - This card was also an eBay find, and I love it because I love trench coat Thing, just as everyone in his or her right mind loves trench coat Thing. This was a good batch! And there's more to come! Back in July, when I got home from Comic-Con in San Diego, I took stock of all the promotional Tick items that were given out at the show. As I mentioned here, it was really a staggering amount of free swag that was given away to tens of thousands of people. The "free" part was only half of it, too, as many of the items were of a nice quality. So I never expected when I went to the New York Comic-Con in October that there would be even more great stuff given out to promote the new Amazon show. I'll post pictures of the actual event and displays soon, but for now I wanted to show the new items that were available at NYCC. In a previous post, I lamented that I didn't have the wherewithal to approach one of the "Team Tick" members in San Diego about buying one of their staff shirts after the event. Well, I managed to talk to the right people in New York and I walked out with an official Team Tick shirt on the Saturday of the show. On the bottom of the shirt, both front and back, there's a printed silhouette of The Tick that's not always easy to see in pictures. Soon after the show in New York ended, someone listed a shirt from San Diego on eBay, and looking at the listing, I saw that the two shirts were actually slightly different, so I was able to grab one of those. The basic design is the same, but instead of the "when destiny calls" phrase on the NYCC shirt, the SDCC shirt reads "Need help? Let us know." The printing on one of the sleeves is different as well. The shirt from SDCC has "stream Aug 25" on it, and the NYCC shirt says "stream now". The big TICK display at NYCC centered around a walk-in replica of "Dangerboat", Overkill's trusty robotic sidekick/mode of transportation. Upon entering, you could fill out a computer-based form with information on your superhero identity, and afterwards you'd get a printout on a sticker. I, uh, went through twice, so I got two IDs, revealing two pretty incredible superpowers. This was similar to the AEGIS website that provides you with a more detailed version of the superhero questionnaire. 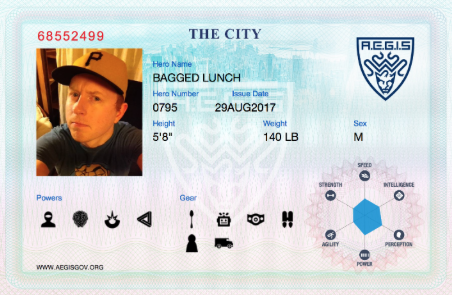 As you walked through the Dangerboat display, you could scan your wristband to get a replica of Overkill's favorite food, Fo-Ham. I talked for a bit with the person who designed the display, and she told me that she and other workers had to put the stickers on the cans by hand. I can't imagine how many hours that took. I'm pretty sure that most of the instructions and nutrition facts on the label are taken from a container of Spam. The picture is certainly Spam. I was able to get my can autographed by Ben Edlund and Griffin Newman! Opening the can revealed not Fo-Ham, but actually a set of Tick enamel pins! The Tick image, probably not coincidentally, is the same as the Tick Twitter icon. After I made it through the display, I learned that there were actually two sets of pins, and I was fortunate enough to get the other set soon after. This one features Arthur's wings and the AEGIS crest. The Fo-Ham and the pins were more than enough for a display like this, but upon leaving the area, I was able to grab an officially branded Tick poncho, taking its cue from the second episode of the series. This thing is giant and heavy. Again, I'm taken back by the sheer number of items that were given away at this show. ...and they weren't done! The official Tick panel was held on Saturday morning, and everyone in attendance got an 11x17 poster, a companion piece to the one given out at Comic-Con, promoting the next six episodes of the first season, airing in February! To get through the display, everyone was given an RFID-chipped wristband. This one would get you access to the Tick display on the main floor, as well as another display for the show "Lore", which was one another floor. This was, again, an overwhelming amount of free stuff. It's great that Amazon is all in on promoting the show! I wonder what they'll give away next? Well, I've finally made it to the end of my Comic-Con 2017 pictures. The show goes full-bore right up until the very end, then everything seems to just stop. I've make it a point to actually see some things beyond the inside of the convention center, as much as I enjoy it, every year, so here's a few pictures from that. Oh, and I bought one of those awesome Tick masks at the show. It really does something for your jaw line. On Tuesday after the show, most of the big banners and other structures come down. See ya, Blade Runner 2049 experience! One of the must-stop downtown locations after the show is San Diego's Cat Cafe. They had some Comic-Con themed events happening during the show, but afterwards is a good time to visit. On Tuesday, I left San Diego and drove a few hours northeast toward Joshua Tree National Park. Just outside is the Palm Springs Air Museum, which houses vintage military planes from various wars and eras. It was really impressive to see. I'm a sucker for art on the side of planes and the stories behind them. Here's some Frank Frazetta-inspired work on the side of The Invader. I never miss the opportunity to find a comic shop in a new location, which probably tells you just how deep the psychosis runs with me. I made a stop at Interstellar Comic Books & Collectibles in Palm Springs. The shop is small any very hip. I grabbed all the new comics I had missed by...uh, being at a large comic book convention during the week. Comic-Con was over, but celebrities were still hanging around. This is Palm Spring's Lucille Ball statue, on the same block as the comic shop. Lucy, Desi and a number of Hollywood stars used to make Palm Springs their vacation home. Later in the day, I went hiking on San Joaquin Mountain (65 degrees versus 110 in the valley) and met a tree with my name. Probably gonna grow my own. On Thursday, I made it to Joshua Tree (115 degrees) and saw a rock that kind of looks like a skull. And that's it! What will I show pictures of next? (New York Comic Con.) See you then! Hey there, meatbags, it's time to take a look at some Futurama-related items from the past few months. I will forever have the softest of soft spots in my heart for Futurama, the Fox-turned-Comedy Central sci-fi/comedy cartoon that has meant so much to me since it first launched back in 1999. I've had some fun and interesting moments surrounding the show both in and around Comic-Con, and well, I guess this is the place to talk about it. I suppose I'll start off with the biggest item on the list. 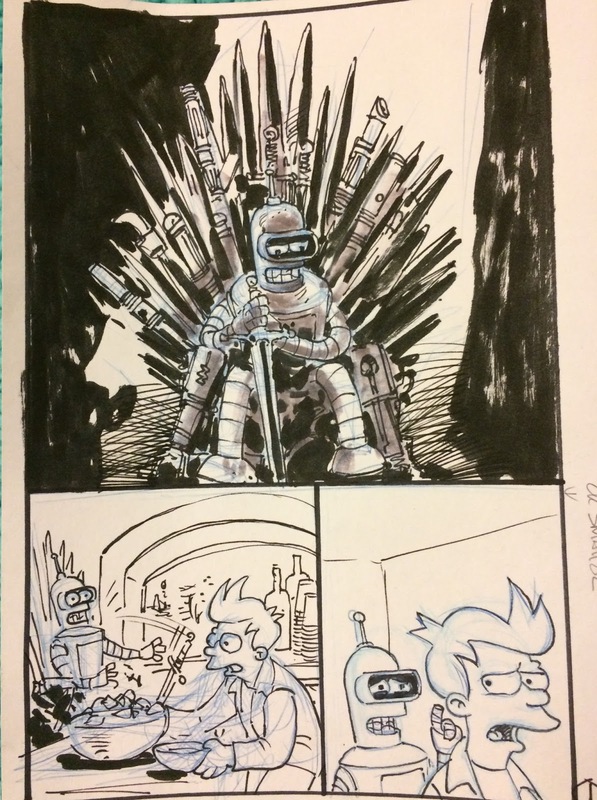 When I was at Comic-Con in July, I purchased some original animated art from the show, as seen above, from the episode "Bender Should Not Be Allowed on Television". I had hoped to get it signed by co-creator Matt Groening at his Bongo Comics booth appearance, but I wasn't able to get one of the randomly-distributed tickets when they were handed out. As I was leaving the booth, I ran into Futurama writer and producer Patric Verrone, and we had a nice conversation. Quite unintentionally, I had bought some eBay items from Verrone a few weeks earlier, and it was an incredible coincidence that not only did I unknowingly make those purchases and exchange a few messages with him after seeing his name on the return address label, but we also just happened to be in a similar space at a convention with over 100,000 people. 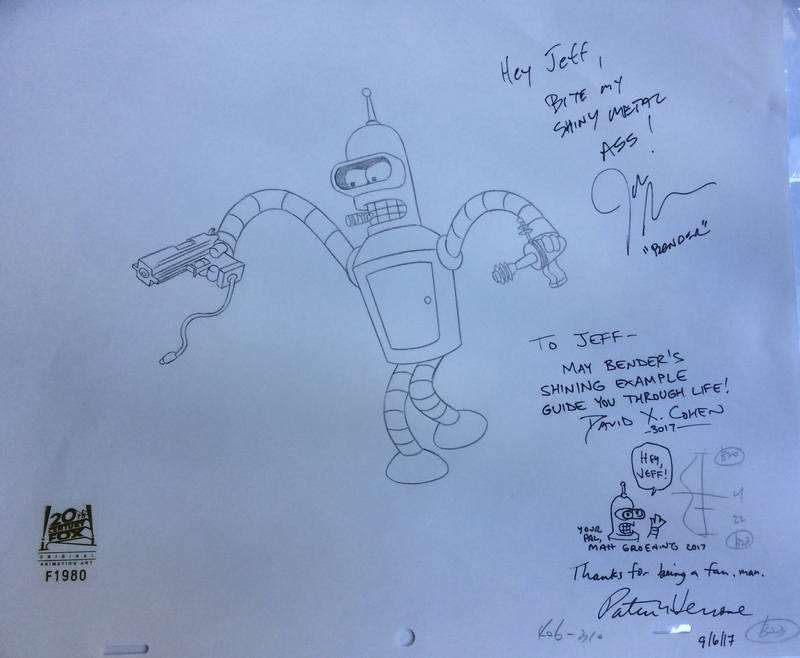 I'm leaving some details out of the recollection, but the short of it is that Verrone took my animation art and not only got it signed by Groening, but also co-creator David X. Cohen and voice of Bender, John DiMaggio (Verrone signed it, too!). Needless to say, I was pretty stunned that this all happened, and I'm naturally pretty grateful to all involved, but mostly to Patric Verrone for the incredibly kind gesture. 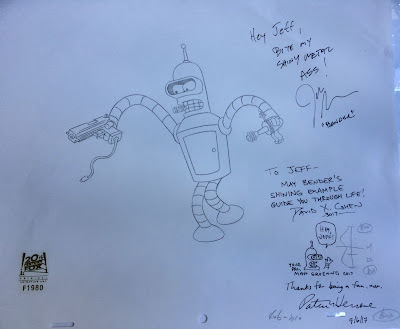 I love that the signatures are personalized, and oh my goodness, check out the original Matt Groening Bender doodle! How unbelievable is that? After speaking with Verrone, I learned that he, Groening, Cohen, DiMaggio and many other Futurama alumni are creating a new cartoon for Netflix titled "Disenchantment", which will air in 2018. I can't wait to watch it, and I continue to hold out hope for a Futurama revival before too long. 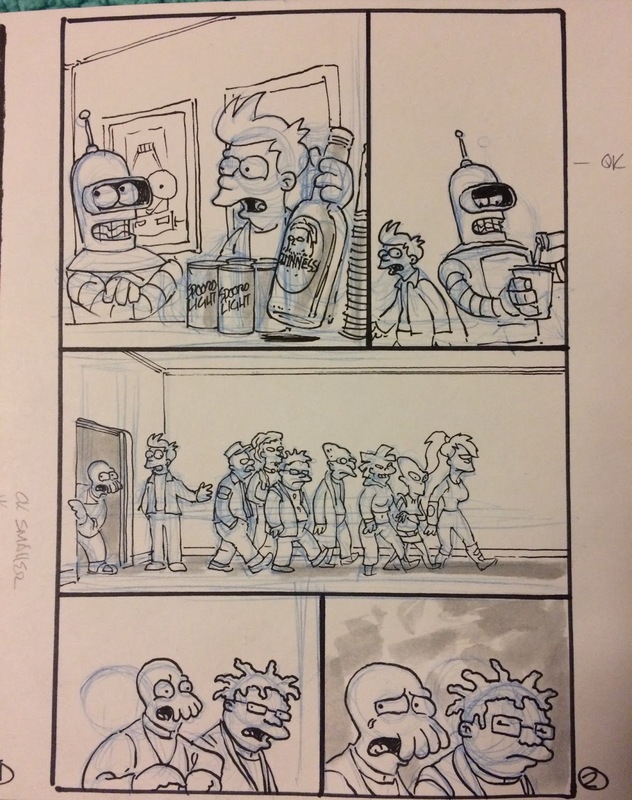 Now let's look at some Futurama related pictures from Comic-Con! Here's me with Patric Verrone after we met at the Bongo Comics booth. I keep pitching ideas to Bongo for their Simpsons-related comic book titles, but haven't had any luck so far. Maybe some day. That's Simpsons and Futurama creator Matt Groening in the yellow shirt, arriving at the Bongo booth for his signing. Near the end of the day on Saturday, I got a picture with Phil LaMarr, voice of Hermes and a number of other characters on the show. In other news, I finally managed to find and buy some Futurama Comics original artwork! 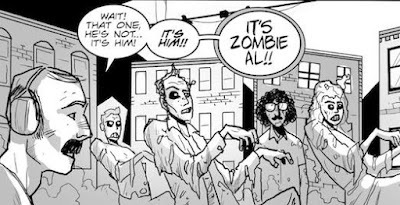 This series was published in print form by Bongo Comics until very recently. 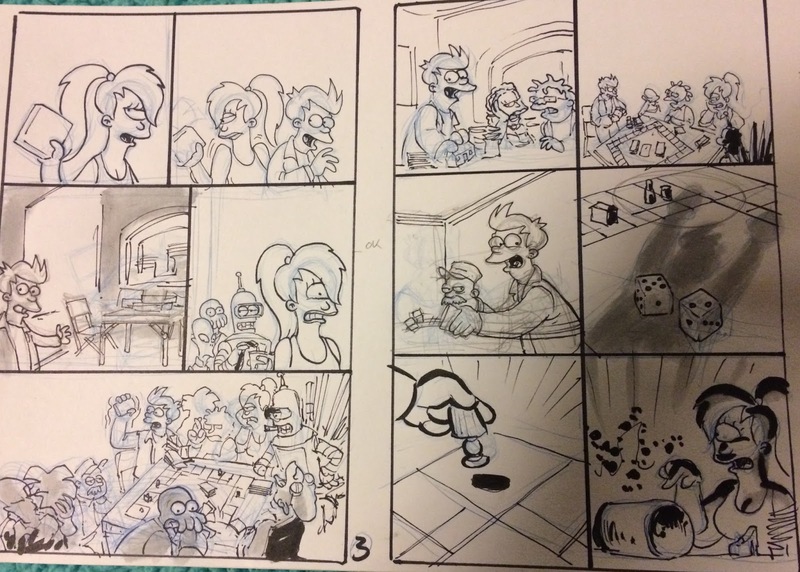 Like a few of their series, Futurama Comics moved to a digital-only platform in the past year. This artwork is by Tone Rodriguez, who shares a last name with Bender - maybe they're related. I'm a big fan of Rodriguez's work...even his 'on model' stuff has his signature style. He's my favorite Bongo artist because he always brings a touch of Kirby to his work. I bought five pages in total - kind of. The art you see here is for a five-page short story, as per the description from the seller of the pages. Pages 1-2 and 3-4 are drawn side-by-side on the same pages, so these five pages are drawn on a total of...three pages. If that makes any sense. 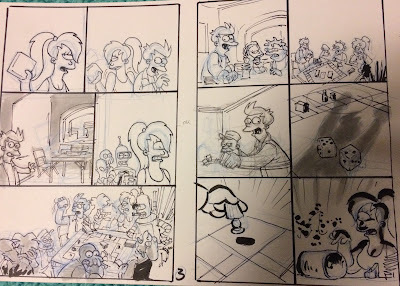 Most Futurama Comics stories are contained to a single issue, and they're all drawn in the same basic style, so they tend to blend together after a while and 80+ issues. As such, I'm still trying to figure out exactly where this story saw print. I'm sure I'll figure it out. 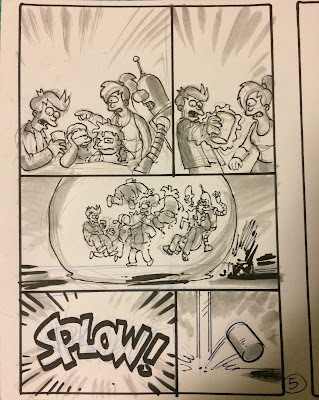 Check out that sound effect! 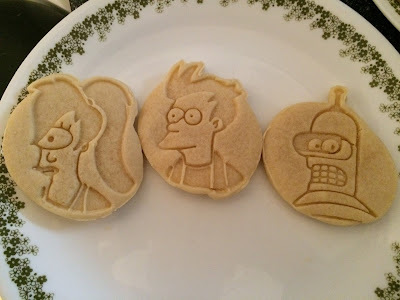 I've written a few more Futurama-themed recipes for the "Eats Like A Duck" food blog, including one for these Futurama sugar cookies! I made the above cookies recently and they turned out really well. Lastly, Futurama kind-of-sort-of returned as a Nerdist podcast double episode with the entire cast and some of the writing staff in September. Have a listen!